The Nokia 5230 is an intelligent enough device, although doesn't do enough to mark itself out from the rest of the smartphone crowd. One of the great truths about smartphones is that you should always match a phone to your actual needs. The Nokia 5230, despite falling short of expectations, is an intelligent device that offers a wealth of unique features. Whether these features match your needs is the real question. Before covering the failings, let's cover the basic advantages of using this phone. The Nokia 5230 is the bargain-bin version of the flagship phone, the Nokia N97. We say 'flagship' as a somewhat slippery term, because the N97 is by no means as powerful as, say, the Google Nexus One and is actually second-rate compared to the much faster Nokia N900. Yet, the N97 is the touchscreen phone set to compete with the Apple iPhone and just about every Android, Palm and Windows Phone device. 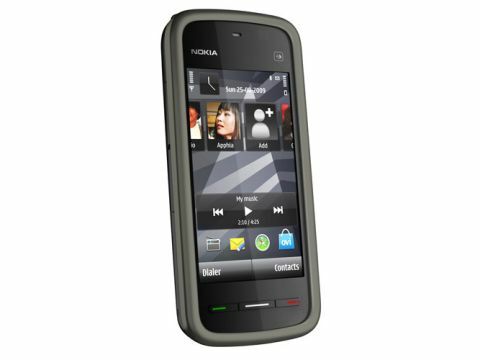 As the entry-level version of the N97, the Nokia 5230 is about £118, or about half the cost of competing smartphones that run well over £200. That's an attractive price point – one that provides all the functionality of a touchscreen device, apps galore, GPS, media playback, a 2MP camera with advanced options such as setting ISO level, and 4GB of storage (on an included microSD card). No, the Nokia 5230 is not an iPhone or HTC Desire competitor, but does have some powerful features. What you don't get is Wi-Fi, and that is one of the major problems with this device. Wi-Fi is useful because it means you can continue using the device inside when your carrier service goes AWOL or when you want to download huge files. The Nokia 5230 also lacks a full hardware keyboard, runs a bit slow at times, has a confusing turn-by-turn voice nav for GPS routing (although the phone supports many languages), low camera quality at just 2 megapixels, and a few minor glitches. In the box Nokia has included the typical charger, manual, and a pair of earbuds with a 3.5mm connector that you will likely discard for a much more adequate set. Our test unit included a 4GB card already inserted into a side compartment, which is included with every Nokia 5230.